Join award winning author and baker Alice Medrich as we explore how to use non wheat flours to make Classic and New Cakes, Cookies, and Desserts all completely gluten free. In this hands-on class, find out how easy it is for a home baker to make a world-class chocolate layer cake, stunning fresh fruit tart, chocolate chip cookies—and more. Recipes are all gluten free, and many are whole grain. Author, chocolate chef, and teacher, ALICE MEDRICH has won more James Beard and IACP cookbook-of-the-year and best-in-category awards than any other author. Her most recent book,Gluten Free Flavor Flours: A New Way to Bake with Non-wheat Flours— a ground breaking approach to gluten-free baking— won the James Beard best Baking Book in 2015. Alice is credited with popularizing chocolate truffles in the United States and introducing the “American Chocolate Truffle” at her influential dessert shop, Cocolat, in the 1970s. 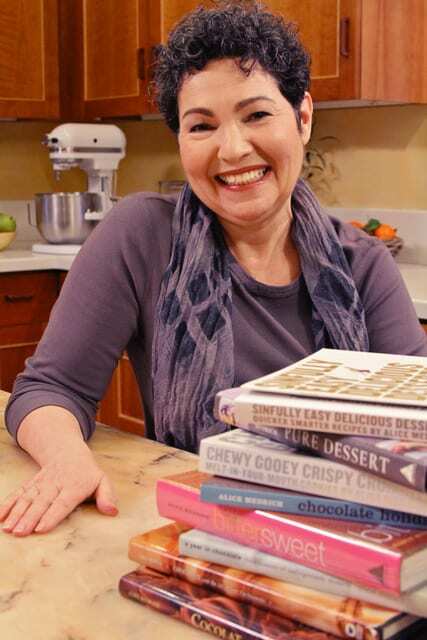 She has appeared on the Food Network’s Chef du Jour and Baker’s Dozen, and Julia Child’s PBS series Baking with Julia. Since leaving the retail world, Alice devotes her time to writing, teaching, and consulting. She is a regular columnist on Food52.com and has a video class on Craftsy.com. Follow Alice on Twitter @AliceMedrich and Instagram @alicemedrich.